The methods we use help the kids have fun while they learn. For the first 3 months, toys, games, songs and dances are introduced to children to make them feel at home while they are in Vidyarambam classes. For instance, in one of the activities, letters or numbers are written on cards and distributed to the students. 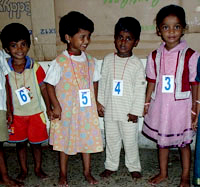 When the tutor calls out a letter or a number, for example, "5", the child with the "5" around her neck has to go to the tutor. The learning aids are straightforward and interesting - number cards, large letters and colourful books. The focus is on getting the children to identify and recognize the letters rather than be able to read complete sentences, since the existing first standard books have complete sentences. This is difficult for children who have not even seen the alphabet before. One of the learning aids in the Vidyarambam kit is a set of attractive pictures of different animals, birds, fruits, and vegetables. Our tutors teach a child to identify these pictures using an interesting method. Once the children are sure of the pictures, they are given loose flash cards of the same pictures (all shuffled) and the children are expected to match the flash card with its identical picture on a separate sheet of paper. On a sheet of paper there were two pictures - a Mango on the left and a Grape on the right. There were two corresponding gaps on the right of each picture to place the matching flash card. Normally, the flash cards are placed on the right side of the picture. One of the children put the Grape flash card on the left side of the Grape picture - between the Mango and the Grape pictures. To him, this was the correct position. But the tutor thought it was not correct, since it was not kept on the right side. How was she to make the child know that though he was correct, he was also wrong? She had an idea, and gave the child the Mango flashcard and asked him to keep it in the right place. Now the child realized that there was no space for the Mango flashcard. After thinking about the challenge for a few seconds, he smiled a little, looked up at the tutor somewhat triumphantly, casually removed the Grape flash and kept the Mango flash card in its place. Then he placed the Grape flashcard to the right of the picture and looked around at all the spectators with a grin of pride for having successfully solved the puzzle! Vidyarambam feels that it has given an opportunity to this child to face a challenge, use his intelligence and solve the problem intelligently and easily. This is the success story of Vidyarambam.